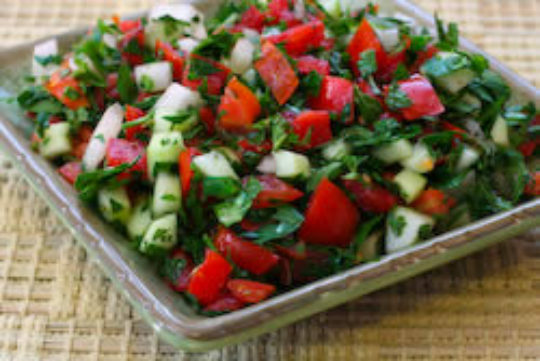 Enjoy this delicious Middle Eastern Salad with salad dressing and then sprinkle crispy pita chips on top. Or for a low fat option, skip on the dressing and serve with cottage cheese or garbanzo beans for a healthy protein packed lunch or dinner. Split in half a loaf of Ezekiel Sprouted Whole Grain Bread and chop up. Then coat the bread with extra virgin olive oil (EVOO) and generously sprinkle with zataar seasoning (found at a spice store or at middle eastern grocery stores). Place in oven at 325 degrees until crispy and brown (not burnt). Toss all of the herbs and vegetables and if you plan on eating immediately toss with dressing. Otherwide, hold on mixing the dressing as the lettuce will get soggy. Toss dressing with salad and then sprinkle crispy pita chips on top, or serve with cottage cheese or garbanzo beans for a healthy protein packed lunch or dinner. To save on calories and fat, skip on the dressing and make your dish with 1 cup of salad sprinkled with pita chips and mixed with 1/2 cup of low fat cottage cheese. Combine olive oil, garlic paste, zataar seasoning and lemon juice.